The black IRC132-PoE Series Short Range 850nm IR PoE Illuminator from Iluminar is designed to be used with true day/night CCTV cameras. This illuminator is invisible to the human eye but visible to black/white and true day/night cameras, which makes it a covert/non-obtrusive illumination. Also, thanks to its invisibility to the human eye, it does not create the problem of light pollution. It has a longer range than visible light due to the higher wavelength of approximately up to 919’ (280m). The illuminator is designed to provide superior IR lighting for CCTV cameras. Supplied with an IP66 rating, this illuminator is vandal-proof and designed for both indoor & outdoor use. The tempered glass panel and die-cast aluminum housing provide protection from the harsh weather conditions and rapid temperature variations (-58 to 140°F). 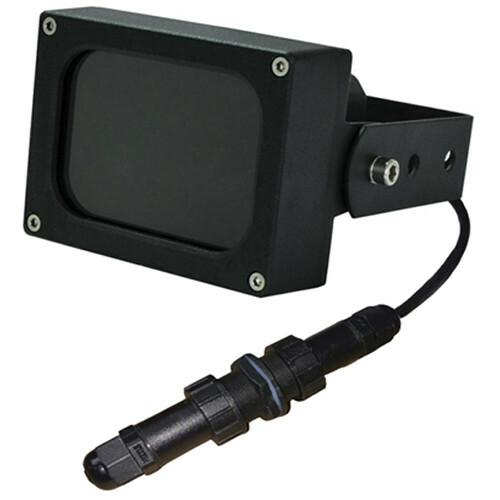 Note: This IR illuminator requires true day/night camera with mechanical IR cut filter. Mount Black powder coated stainless steel wall mount. Box Dimensions (LxWxH) 7.1 x 6.4 x 5.4"